Biomech Tattoo Artist — Malan - Top Realism Tattoo Artist working from Germany, Neuwied. 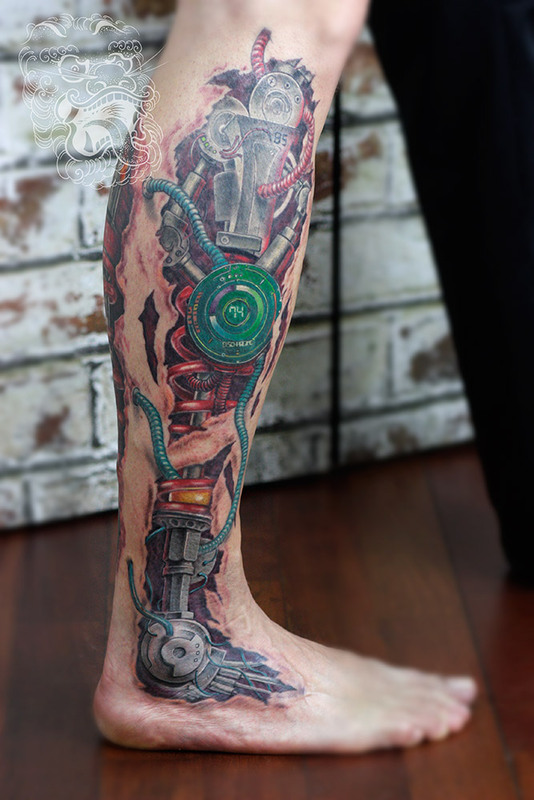 Biomechanical Tattoo became very popular in last years, sice technology and knowledge of tattoo artists progressed a lot. 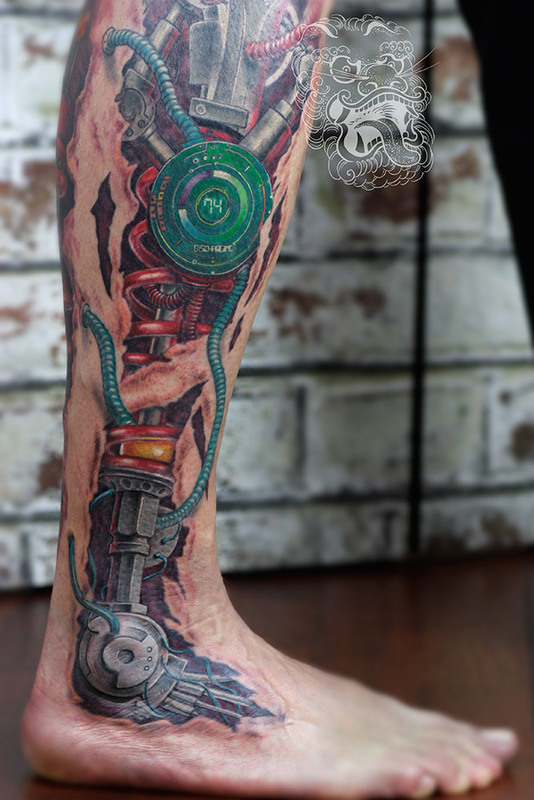 The most important part for biomech tattoos is mechanical part. This is the one that has to be smartly hidden under the skin. This is where artist can tell convincing story, of how person's body got "upgraded" with advanced mechanisms. I personally find very appealing when I have opportunity to inject some modern technologies into the play. Digital clocks, measure devices, tons of cables, titanium bones, armor pads are along my favorites to use here. Although one can use only black to create convincing illusion of deph, I prefer using color as it allows me to make tattoo even more "real". Bio part in biomechanical tattooing is usually restricted to opening the skin, and creating perspective (inside and outside effect). Artifital wounds, exaggerated skin thickness, skin folds, all of them add to the illusion of upgaded man. In this biomechanical tattoo I used broken skin technique to show inside of the customer's body. 3d biomech tattoo - close up view. In the center of attention in this tattoo exist one of my favourite elements - digital clock. I especially put contrast on it using green color, that goes towards the viewer against other elements done mostly with warm tones. Crucial attribute for biomechanical tattoo design is consistency and logic. Elements have to look like "something that could work". So round elements should be located along the joints - allowing rotation, perspective should be consistent and convincing, cables should start and end somewhere (not ending floating in free skin). If something goes under, can not arrive again above without any reason. Working mechanisms are build with logic. So it is best to utilize it towards best biomech tattoo design. In my designs I also like using my "two joints" rule. Mechanical tattoo will always look better if it is not too small. If You use two different joints to show mechanical part, the effect will be much stronger, much more convincing. 3d biomech: Back view was used to complement consistency in the way, his calf is mechanically upgraded. Implementation of my idea o minimum two limbs helps to create convincing, dynamic story. In many sources biomech tattoos are often mistaken for organica tattoo style. It is easy to guess that organica tattoo represents completely different approach to body alternation. In this style, no mechanical elements are used. All is made of bio/organical parts. Mecha part is non existent in organica tattooing.